Avanti 12 Bottle Thermoelectric Counter Top Wine Cooler - Model EWC1201 (March 2019) Review! 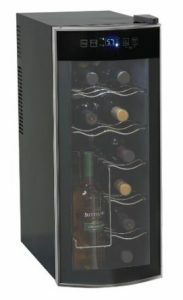 Avanti 12 Bottle Counter Top wine cooler is a great product aimed for wine lovers who don’t require higher storing capabilities. Priced at just around $110 bucks this is definitely a recommended product. It is a single zone cooler so you won’t be able to store two different types of wine in it. It weighs around 27 pounds and you can easily place it on your counter if you like. The innovative design allows you to store 4 bottles in vertical position, you can also store larger sized bottle in those spots. The rest of the stuff is standard, it uses thermal electricity which is quite common right now. Due to this there is no vibration at all this makes sure that bottle sediment is not disturbed at all. The overall design is also good with the platinum finished accents look good with any decor. We’ve got some complaints that the fan can get a bit noisier if kept in a closed place. In such cases all you need to do is change it’s position giving it more open space. Since the ventilation is on the side you have to make sure it is not getting blocked. The final judgement on this one is definitely positive due to the quality it provides at such low price. We recommend you take a look at some of customer reviews here before making your final decision. We’ve also reviewed other wine coolers on our site. If you’re fishing for a good wine cooler then we definitely recommend that you take a look at them. For smaller needs in similar price range as this one, you can go for Haier 6-Bottle Wine Cooler, if you require bigger holding capacity then you can check our Allavino FlexCount VSWR36-2BWFN Black 36 Bottle Dual Zone Wine Cooler Review. To take a look at the best wine coolers in the market right now click here.